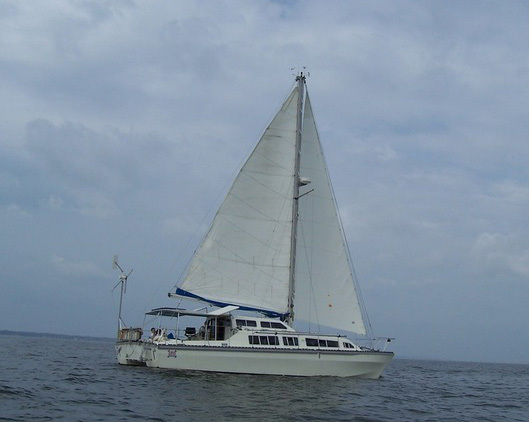 The 12M Catalac 41 is considered a limited production cruising catamaran designed for live aboard cruisers and perfect for passage making. The S/V Angel Louise, pictured above, completed an Atlantic crossing in July 2011 and back across again in 2014. Ed and Sue Kelly began the crossing from Brunswick Georgia and traveled to England via Bermuda and the Azores. 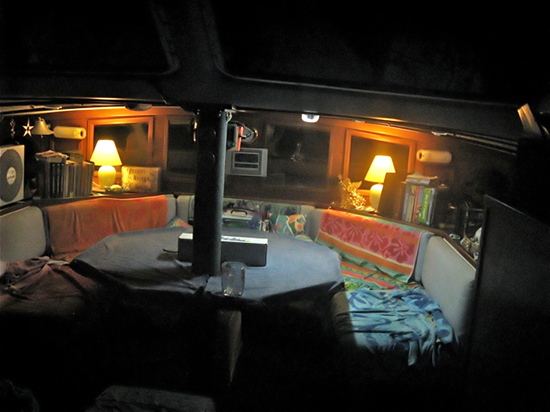 These boats offer a seven berth layout in spacious style with furnishing and trimmings to match. 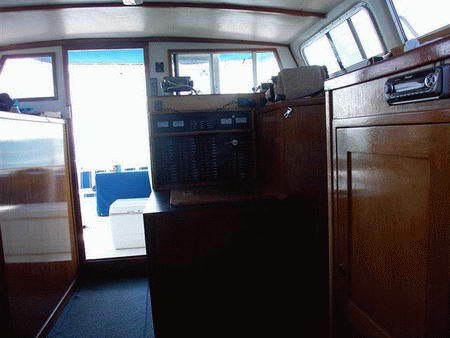 Designed for living in style Full standing 6' 5" headroom in both hulls and wheelhouse, and of course plenty of room when you sit down to your meal in the main saloon making entertaining on the Catalac an absolute pleasure. 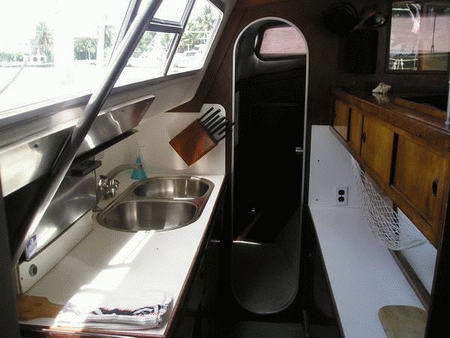 The galley is located in the port hull and offers hot and cold pressurized water, a refrigerator, a four burner hob, oven and stainless steel sink with integral draining board. The central saloon area with its octagonal table has permanent seating for five in luxury on 6 inch thick cushions, with more than ample elbow room. Everywhere you'll discover masses of locker space. The build quality is outstanding. 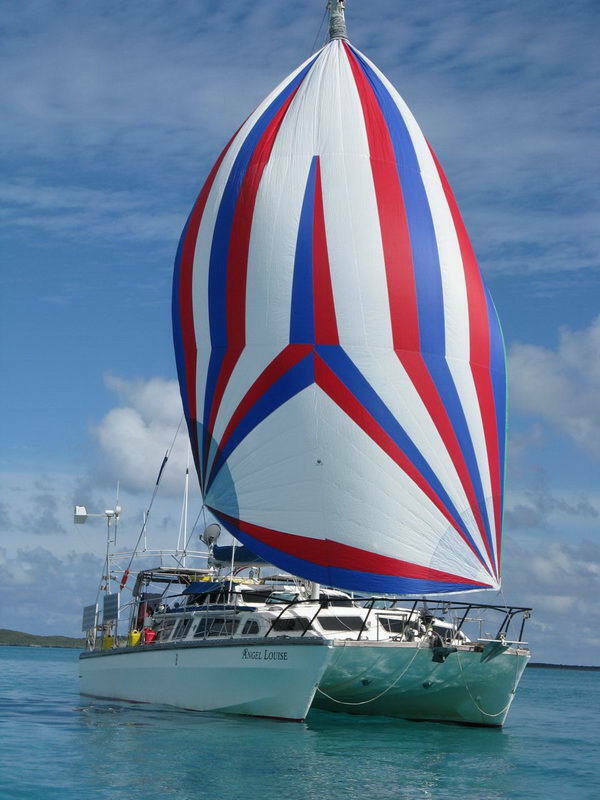 It should be noted that a 12M Catalac 41 survived the worst storm on record in the Pacific (Queen's Birthday Storm), at ground zero, without losing it's mast or any of her crew receiving injuries. What makes this important, is two other catamarans were damaged in the same storm, and every monohull in the area was rolled and dismasted with loss of life. 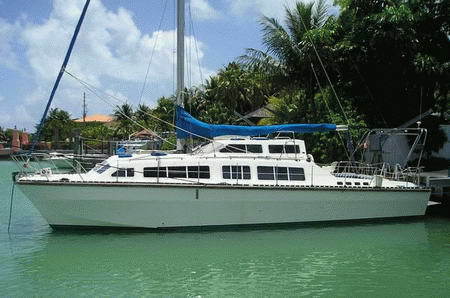 These boats have the reputation of being a very well built, seaworthy boat and have been called the best live aboard cruising catamaran ever made. The interior steering position is just aft of the saloon. Full instrumentation and dual controls for the twin diesels, plus all the desirable navigational aids are standard. Space is also available for a radar display. The helmsman's built-in seat provides a high degree of comfort for any watches spent at the wheel, in the company of those relaxing in the saloon. are the cabin windows. They actually open. The first position is 1/2 open which allows airflow in rain storms without allowing water in the boat. The 2nd position is completely removed, and window screens can be fitted into the window openings. This is a perfect example of the thought that went into the cabin design. Airflow remains constant leaving the cabin comfortable in tropical climates. All windows in a Catalac are tempered glass and look as good today as the day they were installed 25 years ago. 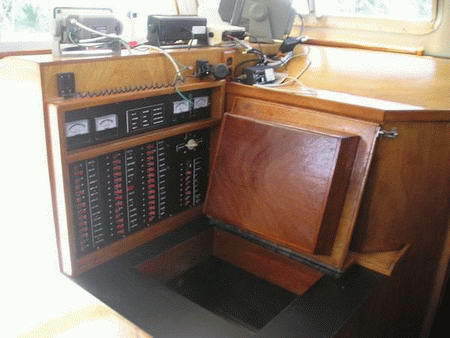 Yes, this is a rare and rather expensive feature when compared to the plastic windows in most cruising catamarans, yet it's entirely worth it as it's another reason why these boats seem to age gracefully. Nobody can suggest that there is 100% safety at sea, but the 12M Catalac 41 has been thoroughly designed to promote that aspect of cruising above all other considerations. 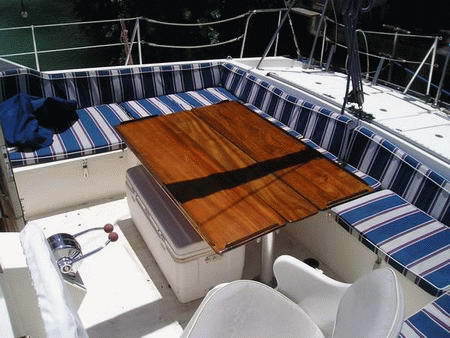 The famous Catalac underwater hull configuration and the boat's short rig allows the boat to slip sideways when over-canvassed in strong wind conditions; thus creating more leeway rather than the dreaded capsize that others fear. The low aspect Bermudan sloop rig has been chosen to bring the centre of effort down to give you and your family that added feeling of comfort and safety every time you are caught out in stronger wind conditions than you would normally seek. 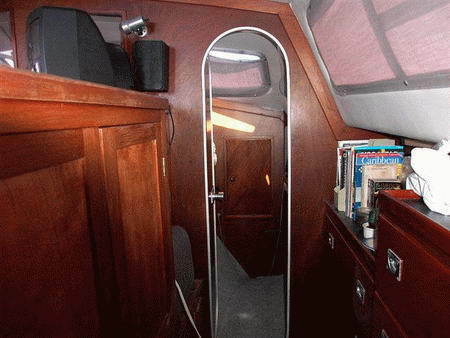 Sailing a 12M Catalac 41 is a very rewarding, comfortable experience. Despite the designed-in safety features the Catalac is by no means a slouch. She will sail easily to 40 degrees off the wind at a steady speed of 7-8 knots in an 18 knot breeze and in stronger conditions can easily maintain a speed of 9-10 knots. Off wind the performance is not bettered, but sail in the Catalac in a 30-40 knot wind, stand upright in the cockpit, walk around comfortably throughout the cabins, make yourself a cup of coffee in the galley, and then look over your shoulder to that similar sized monohull, with stanchions and windows awash, wallowing from side to side, preparing herself for a wild broach or heeling at 35 degrees, their crew harnessed to any available strong point, with an occasional bucket of water being thrown down their necks. 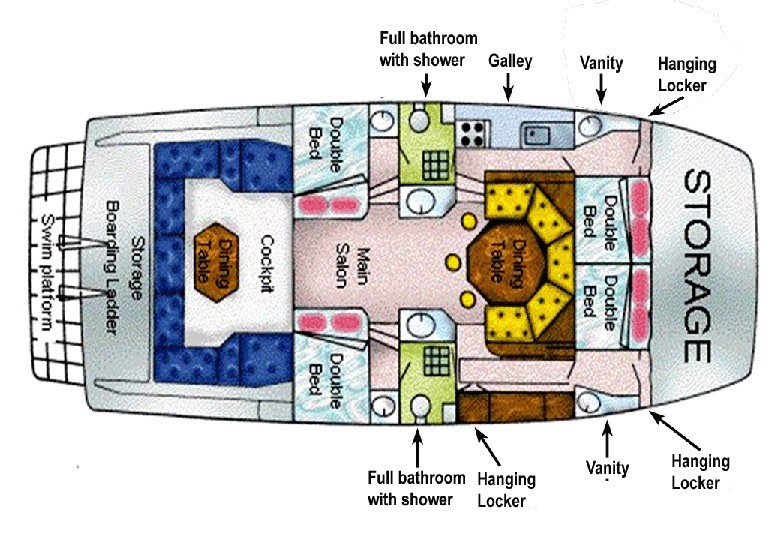 You will compliment yourself on your choice of an extremely comfortable, safe, seagoing sailing yacht, your 12M Catalac 41. Stay' type and is included in the standard inventory of all the Catalacs. Reefkit is a made-to-measure headsail reefing kit which entirely replaces the forestay, bottle-screw, etc. from masthead to sternhead. By supplying a system which not only includes the top and bottom swivels but also the connecting forestay and mast and stemhead toggles we can ensure that your mast is both safely and correctly stayed. All structural components are machined or forged from marine grade 316 stainless steel. The Reefkit is supplied with a halyard slider which replaces the conventional two-part halyard arrangement and allows the reefing genoa to be hoisted using the existing mast halyard. This arrangement has proved extremely popular with cruiser racers as the headsail can be handled in the conventional way. The luff bolt-rope is fed into the entry section of the Rotostay spar but instead of the sail head being shackled directly to the genoa halliard it is connected via the halyard Slider. The Halliard Slider is basically a hollow swivel that can slide up and down the luff spar. When connected between the sail and the halyard it permits the sail to roll up without twisting the halliard around the spar. The sealed bearing design allows for full luff tensioning using the halliard winch in the normal way. When the sail is to be left furled up for any length of time the halliard can be eased off a little thus relaxing the sail/luff tension. In the 12M Catalac 41 we have retained all the traditional elements of cruising but have added further dimensions in terms of safety, accommodation, comfort and when necessary, speed. Passage making in a 12M Catalac 41 is an exhilarating experience. If the wind pipes up too much, then jib furling gear quickly rolls the headsail around the forestay to shorten sail. And with the benefit of slab reefing on the main, sail handling could not be easier. Instead of heeling and bucking its way through a heavy sea, the Catalac remains a stable platform for all who sail. Even children who may be bored by long passages can play happily and safely below deck, or in the spacious cockpit. A 12M Catalac 41 will glide you safely and at speed out-performing cruiser/racer monohulls of a similar size. These boats won their class in ARC Atlantic crossing competition several times. So you arrive, whatever your destination, quickly as well as in style and comfort. 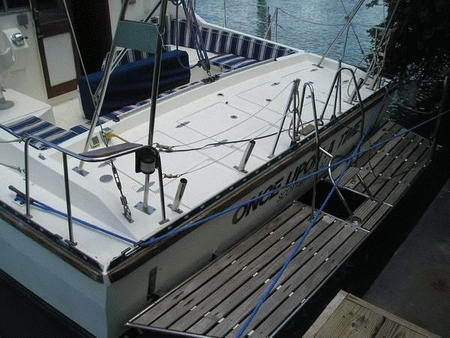 The Lack family did not compromise on sailing performance or comfort in the 12M Catalac 41. 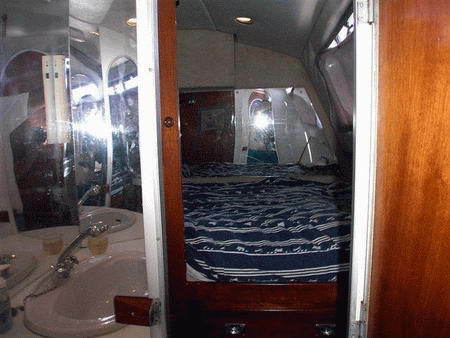 Below decks you will find each of the main sleeping compartments and the main saloon finished to a high standard with just the right amount of woodwork to enhance the few functional synthetic finishes they adopted. 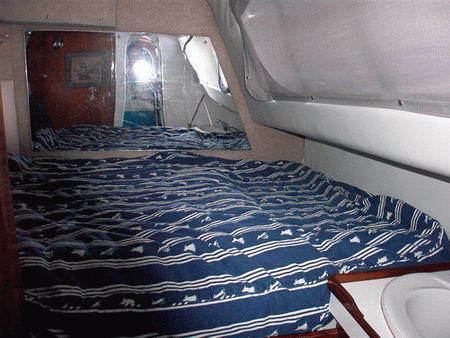 The owner's quarters on the 12M Catalac 41 are very well appointed and include a forward starboard cabin with double berth, a large adjoining dressing room with vanity unit and chest of drawers. To the rear of this is the large shower room and head with hot and cold pressurized water. A second head compartment is positioned in the port hull. Production started 1983: 27 manufactured: 14 located America. is considered by many to be one of the best live aboards ever built. Aux Power Options: 2xYanmar 3HM35 diesel coupled to propeller shafts. In October of 2005 Hurricane Wilma struck near Jupiter, FL with 125 mph winds. Jupiter is about 80 miles south of Melbourne, FL. Although we escaped the full fury of this storm, Melbourne, FL received more than a glancing blow. There was a Catalac 41 moored in a sheltered mooring field in Melbourne. 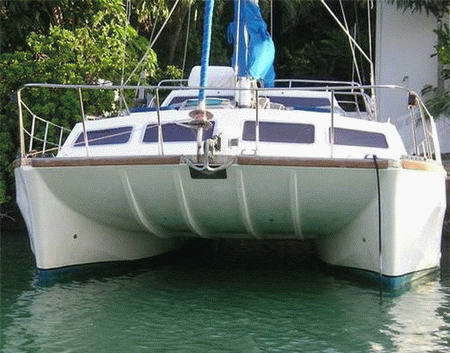 As the winds increased to around 85 mph, she broke her mooring line. Cast adrift, the storm winds drove her upon a rocky causeway. For hours on end that boat was pounded on the large rocks on the north side of the causeway. The crew was not onboard, and there was absolutely nothing that could be done. I heard about this boat on a local radio station, so... as the hurricane moved across Florida, and the winds abated, I grabbed my camera and headed for that boat. The Catalac 41 survived but with serious damage to her port hull. She was salvaged and there was an attempt at repair and refit. 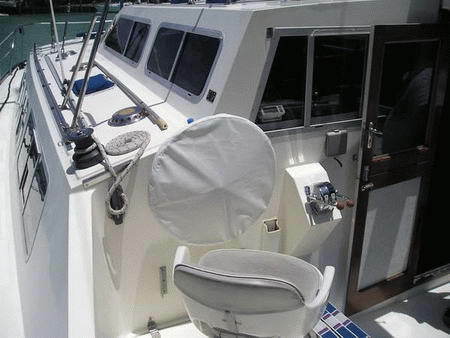 Unfortunately, the refit was botched. The inexperience of those responsible for the refit left this boat an abandoned wreck. (click here for photos) or click the hurricane damage button in the 'Catalac Related Articles' menu.